Late last year we worked on an adorable little green house (Customer's Non-Colonial Colonial) replacing some railings and shingles and cutting an archway from the kitchen to the dining room. 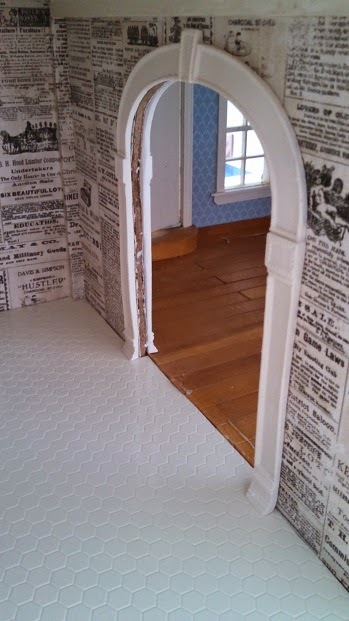 Customer took dollhouse back home and removed the old wallpapers and prepared the ceilings so when she brought it back to us, we could install new papers and glue the arch trims in place. Then, after customer removed papers and returned it to us, we installed the arch trim on either side of the archway. The raw edge of the wood wall between the arch trims looks uneven and nasty. Even if we were to paint it, it would not look as nice as I'd like. So in went the wall spackle fill . . . The other part of the house that turned out nicely was the living room. Customer picked a blue paint for the top of the room and a stripe wallpaper for the bottom part. 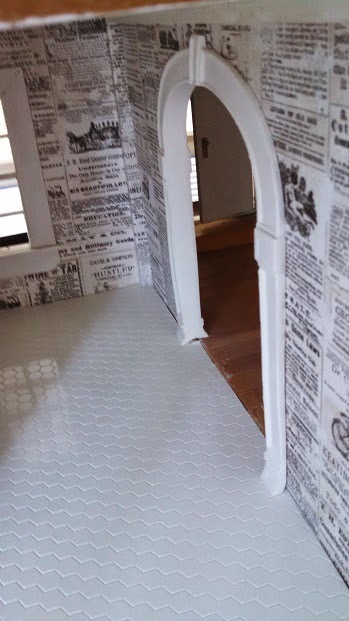 Papering and painting around all those non-removable stairs, door trims, window trims and baseboards was tricky but I think it all turned out nicely enough in the end! 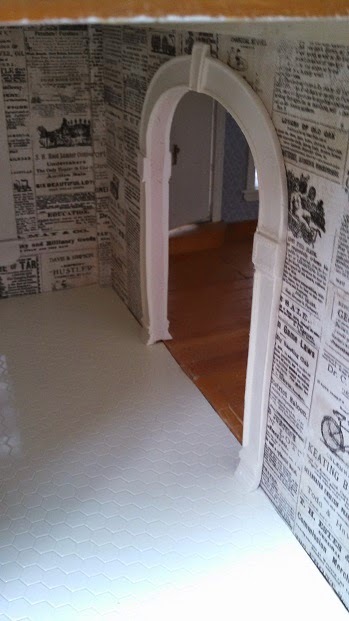 I am glad the customer took our advice and went with the same paper for the bathroom and hallway: all we did was cut the border off for the hallway walls. Tied the two rooms together yet kept the bathroom a separate space. This area was too small to do two separate color/coordinating papers so this was a nice compromise. Customer wanted to keep the original yellow tile that had been in the bathroom so we thought the ducky paper went well with it. Attic rooms got a fresh coat of paint. Overall, this house is going to make a little granddaughter so happy when she gets it for her birthday! What a great gift! AFTER: A bright and cheery home ready for play! And another dollhouse survives, passed down to another generation, for hours of enjoyment and play! So we had this pink house dropped off for a good cleaning for a child's birthday on Feb. 21st. Owner didn't know much about it; it was her childhood dollhouse that she was now passing down to her own child. Wasn't even sure if the person who made it for her had built it from scratch or from a kit. She suspected it was built from scratch. It was constructed with 3" high siding strips glued to corner pieces (which is why at times you can see gaps or separations where customer's relative did not have them lined up exactly right). Staring at it pricked at my brain, making me think I should remember something. But, it was a simple job to just clean the outside, wash the curtains, and to glue the broken railings back together and onto the house. So I ignored the nagging voice in my brain (not an easy thing to do) and got to work . . . .
Before: Dirty and missing railings on the top porch. After: Cleaned up and railings are glued back together and onto the house. Before: All the railings and porch posts on the second level were broken to pieces and missing off the house. After: Railings were glued together and reattached to the house. After: a good scrubbing makes it look so much better! Before/In Process: Cleaning the house. After: Railing on side porch is repaired too. It still bugged me though. That voice in my head would not shut up: Something about this house was so familiar. Then it hit me: We've worked on this type of house before! Our first repair house was this same style house, only in a black and white color scheme, back in 2004. Two separate houses with the exact same layout and construction method. And, yesterday I found a third one of these homes for sale on Craig's List. This was definitely not something the customer's uncle/father/grandfather threw together for her - not unless he made 3 of them and I happened to have found all three within 11 years of each other! Must be from a kit, but what an unusual kit that you construct using siding strips! I have tried researching this house (as of yesterday) but have not discovered (yet) who created them. They are cute though! 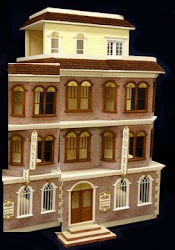 And if anyone out there knows anything about this house and/or any kit it may have originated from: please let me know so that I can ignore the "continue to research it until you find answers" voice in my brain. It needs to be silenced so that I may enjoy the "have some more chocolate" voice instead. Harborside Manor was picked up almost a week ago and I miss it. Not that the worktable is empty now: there is a green house we worked on previously (Non-colonial Colonial) that has returned for wallpapering and a blue Holly Hobby house that is being electrified and finished. And, as always, my friend's Contemporary Ranch kit is partially assembled/painted and waiting for my attention. But before we move on, I wanted to officially have closure on the Harborside Mansion . . . here are the before and after pics (with a brief recap of work done) of this beautiful home. Before: Attic Left, removed wires from back walls and installed décor. After: Attic Left, now a laundry room and bathroom. Before: Attic Right, removed wires across back wall. After: Girl's Bedroom, sconce wired to bathroom wall and décor installed. Second floor is next - all lights had to be wired to a new tape run installed on 3rd level floors. Glue spots had to be removed/chipped/sanded out. And décor was installed in all rooms. Before: Study/Office, wires moved from ceiling to floor above. Before: Bedroom looking into Bathroom, that glue spot in the back corner was killer to remove! After: Bathroom as seen from the front of the house when bay door is open. First Floor: again, wires were moved from ceiling to floors above. Kitchen wall was glued in place. Arch way was cut from Kitchen to Conservatory. Décor was installed in all rooms. Before: Conservatory, here you can see what a difference that arch makes! After: The Bay, with door open, looking into the Bathroom and Dining Room. Those angles needed for the trims were a headache! After: looking from the kitchen into the dining room - sorry it's crooked! After: Whole House, love those floors! Although it had it's moments of frustration (don't all projects?) it was a beautiful house!